LIVERPOOL - Manchester City's never-ending record in the Premier League - the English Premier League's top caste - stalled at the 23rd week. Liverpool became the first team in the Premier League to stop Manchester City's Premier League record this season. 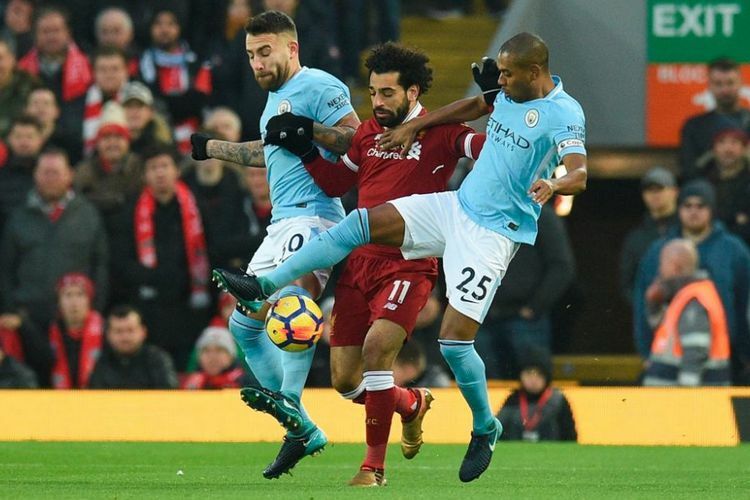 Playing at Anfield Stadium, Liverpool won 4-3 over Manchester City on Sunday (14/1/2018). This game can be said to be dramatic because the host had a 4-1 lead first. Four goals of Liverpool's victory were scored by Alex Oxlade-Chamberlain (9 '), Roberto Firmino (59'), Sadio Mane (61 '), and Mohamed Salah (68'). The three goals returned by the visitors are Leroy Sane (40 '), Bernardo Silva (84'), and Ilkay Guendogan (90 '). Liverpool became the second team to beat Manchester City this season. Previously, Pep Guardiola's troops have lost once from Shaktar Donetsk in the Champions League. Victory over Manchester City put Liverpool up to third place Chelsea. Both teams are both collected 47 points, but Liverpool winning goal difference. Manchester City remain top of the table with 62 points. Manchester United, second in 47 points, had a chance to cut back on Stoke City on Monday night (15/1/2018). As quoted updetails.com from Premierleague.com, Man City actually appear more dominate. They lead mastery of the ball up to 64.4 percent. In terms of opportunities, The Citizens have 11. As Liverpool has 16 chances. Taking the initiative to attack since the beginning of the game, Liverpool immediately winning 1-0 in the 9th minute. Receiving Roberto Firmino's opera, Oxlade-Chamberlain unhesitatingly poked a hard kick from outside the penalty box that Man City goalkeeper Ederson Moraes could not afford. In the 35th minute, The Citizens threatened back. However, Kevin De Bruyne's long-range kick can still be caught by Liverpool goalkeeper Loris Karius. Five minutes later, Man City really equalized. Got a long distance feed from Kyle Walker, Leroy Sane broke into the forbidden box of Liverpool. Sane then fired hard at the pole near Liverpool and changed the scoreboard to 1-1. Entering the second half, Man City got a golden chance first in the 51st minute. Starting from a corner kick Leroy Sane, Nicolas Otamendi with a steady headed the ball. However, the skin round only on the Liverpool crossbar. For five minutes, Salah had a chance to bring the Reds ahead. This time, Erik's kick from inside the 12-fitting box countered brilliantly by Ederson. In the 59th minute, Liverpool fans cheered because Firmino successfully vibrate the nets Man City. Received feedback breakthrough from Chamberlain, Firmino cleverly kicks off the cungkil from inside the penalty box. Just two minutes later, the Reds back to add a goal. Sadio Mane accurately pierced the hard kick from inside Ederson's unbounded box. In the 68th minute, Ederson made a mistake. He failed to sweep the ball perfectly so as to facilitate Salah to pack a long-range goal. Man City was able to minimize lagging to 2-4 in the 84th minute by kicking Bernardo Silva from close range. The Citizens seemed to get up from sleep by scoring a goal in injury time. Receiving a cross from Sergio Aguero, Ilkay Guendogan calmly menceploskan goals via a measured kick. 4-3 score for Liverpool remains unchanged until the long whistle sounded. 1 Response to "Liverpool Give Manchester City the first defeat in the English Premier League"